Happily, there's a lot more information to be had with this province, unless the North West Province. A lot of that has to be do with the political situation in Sri Lanka during the Civil War. For most of the Civil War, much of the Eastern Province was under the control of the LTTE. After the Indo-Lankan Accord of 1987, where powers were devolved to the provinces, the Eastern Province was temporarily merged with the Northern Province to form the (wait for it...) North-East Province, but no one really liked that since that merged province took up about 25% of Sri Lanka's total territory and during the Civil War, people weren't too tickled by the idea of the LTTE potentially having that much territory to potentially grab. Eventually the province was de-merged officially in January of 2007 and recaptured by the Sri Lankan military later that year. The province suffered in the aftermath of recapture by government forces as pro-government Tamil militias kept their arms until the final defeat of the LTTE in 2009. This flag was adopted on May 22, 2007 along with the flag of the newly formed Northern Province of Sri Lanka. It features an eagle, a fish and a lion in each of the circles within the flag and has suns in each corner. 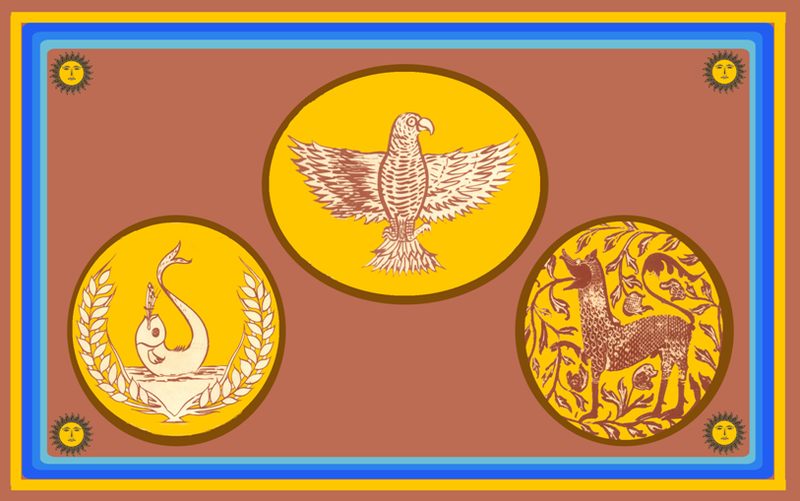 The three symbols represent the three districts of the province. The Eagle symbolizes Trincomalee, the fish stands for the district of Batticaloa and the lion is for the district of Ampara. The capital of the province is Trincomalee and it's largest city is Kalmunai. You know, this is actually a really cool flag. It's design is clean and I like the symbolism with the circles- Trincomalee being the most prominent city in the province, historically speaking, taking the central position. I can honestly say that I would probably jump at a chance to own this flag... it's neat. I dig it. While the North West Province was more vague with it's symbolism, this flag has clear meaning and nice, understandable design. It might be my favorite flag of the challenge so far. So, that's the Eastern Province of Sri Lanka. Remember, until next time, keep your flags flying- FREAK or otherwise!